I have been playing a lot of tennis…for ME. During the summer, I was on the court 4-5 times a week. Sometimes twice in one day. That’s doubles, two hours at a time…so 8-10 hours. Then I learned that one of the men I play with had a week of 14 matches, two times each day…a total of 25 hours. I think he is around my age. What a guy. Hahaha. This 80-year-old has a terrific, upbeat attitude about how to live a life. Check out his “Hot Grandpa” modeling moves in the first 30 seconds of the video below. I have written about freerunning/parkour before. But this example is much more powerful. It talks about some young men in Kashmir, where I have visited decades ago, before tourists were beheaded and military conflicts were so common. These youths are angry and scared. But after learning and practicing their art, they are calm. Watch it for the context, not the beauty of the moves. And feel blessed that you do not live there. When Kayla Itsines’ younger cousin suggested she download an app called Instagram to keep track of her clients’ progress photos, she didn’t think much of it. Fast forward to the present and she’s Australia’s most popular personal trainer and is taking the fitness world by storm. Itsines’ success came initially from her Bikini Body Guide eBook — and with newly released app Sweat With Kayla, she doesn’t look like she’s stopping any time soon. “It all started when I graduated from the Australian Institute of Fitness in 2009 — my first job as a personal trainer was in a women’s-only personal training centre,” she says. When Ms Itsines went solo and started her mobile personal training business, she began uploading her clients’ progress photos to Instagram — and followers began asking if she could help them in different States. “I just said unfortunately I couldn’t because I was in Adelaide,” she says. But make the guide she did and as more people bought the Bikini Body Guide and started following Ms Itsines, the more her influence grew. It’s obvious she isn’t as concerned with being famous as she is with helping people with their health and fitness, though — and women gaining confidence is her number one priority. “I love helping people in general, it’s just what I do,” she says. Ms Itsines names her world tour as the highlight of the journey so far. “My favourite experience was London because I couldn’t see the girls before I came out — I got to open these double doors and they were all standing in front of me,” she says. Perhaps most importantly, Ms Itsines is staunch in her opinion about fad diets — she advocates a lifestyle change for her clients which will last a lifetime. “I want clients to feel good about themselves — that’s something I try and bring across,” she says. Here are excerpted paragraphs from an amazing and long story about Alex Honnold, one of the world’s two or three greatest rock face climbers. And he does what is called free soloing: no ropes of any kind, neither to help him up or to prevent a fall. He risks death every time. What stands out for me is not just what he does, but that he does not seem to have any fear about doing it. Especially when I am merely trying to not tense up in a game, when I am serving a tennis ball. Both times watching the video I felt my palms go sweaty. Terrifying. Unroped climbing is, of course, the oldest kind, but ropes and hardware can provide such a reliable safety net that nearly all climbers now use them. This is typically done in pairs, with one climber tied to each end of the rope, moving one at a time. But using gear slows progress. A roped pair, taking turns climbing and fussing with all that equipment, might spend six hours on a climb that a free-soloist floats up in 30 minutes — focusing purely on the pleasure of movement, the tactile sensation of hands on rock. On cliffs where even elite climbers employ complicated rope systems, the free-soloist wears only shorts, a T-shirt, a pair of climbing shoes and a bag of gymnast’s chalk to keep the hands dry. Honnold has free-soloed the longest, most challenging climbs ever, including the 2,500-foot northwest face of Half Dome in Yosemite Valley, where some of the handholds are so small that no average climber could cling for an instant, roped or otherwise. Most peculiar of all, even to elite rock climbers, Honnold does this without apparent fear, as if falling were not possible. At one level, free-soloing can be seen as the most extreme expression of the same progression: One generation aid-climbs a route, the next climbs it in record time, the next free-climbs it, then it’s time for someone to climb it without ropes. But free-soloing is so much more dangerous and frightening, even to highly experienced climbers, that a vast majority want no part of it. Climbers know that fear itself can cause a climber to panic on the side of a cliff. To get a sense of the experience, try a thought experiment: Picture hanging from a pull-up bar in a playground, with your toes inches off the ground, and feel the calm security of your grip. Now imagine standing on the edge of a skyscraper with that same pull-up bar suspended at eye level two feet in front of you. Lean forward to grab that bar and let your feet swing free, so that you’re hanging by your hands. Look down. How’s your grip now? Even if you have perfect confidence in your climbing ability and perfect emotional control in the face of danger, as Honnold appears to, most climbers fear the unexpected: the handhold that suddenly breaks, the bird that erupts from a hidden nest. I was once 50 feet up a Yosemite cliff when thousands of biting ants poured out of the rock to attack my bare arms and legs. Free-soloists also die with alarming regularity. Honnold enters death-fall territory with the same casual deliberateness that someone might apply to arranging knickknacks in a bedroom. Then I mentioned how I had hurt my back as well and felt really uncomfortable rising from a bed or chair. How I couldn’t sit for more than a few minutes in one position while driving. And then I would reach the tennis court and start playing…and within minutes I wasn’t even aware of any problem. I wouldn’t even think about it until the match was over. Movement is everything, the doc told me. 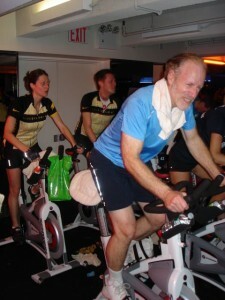 Keep moving to improve blood flow, warmth, oxygen. It reminded me of what I once read about the famous cellist, Pablo Casals, who was so arthritic he could barely move around, dress himself or use his hands. But then he would shuffle to the piano or cello, slowly arrange himself and start playing effortlessly and smoothly. His body would transform into suppleness and ease. The link above refers to Norman Cousins great book, Anatomy of an Illness, which illustrates the power of the body over the mind. Tennis is my cello…should be a book title. Wilson Kipsang of Kenya won the New York City Marathon in 2 hours 10 minutes 59 seconds — or as I like to call it at my age, a good night’s sleep. At 60, I also ran Sunday’s race, one of about 3,000 windblown geezers among the field, expected to be 50,000. “You need a pacemaker?” German Silva asked the other day. “Hopefully not installed,” I said. 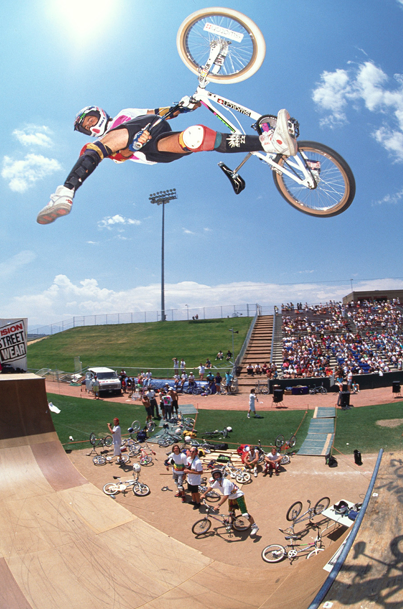 In 1995, before German’s second consecutive victory in New York, I joined him at 13,000 feet to train on the side of a volcano in his native Mexico. By “joined,” I mean that he ran up the volcano while I rode in a car with his coach. A few weeks later, German finished first in New York, and, well, I finished. Actually, it was the only time I broke four hours. But that was nearly 20 years ago. Whatever speed I possessed receded with my hairline. In April, I ran my first Boston Marathon: 5 hours 20 minutes. That is less a time for a race than a time for a crockpot recipe. Not that 60 is a regretful age. Not at all. I’m much healthier at 60 than I was at 20. Back then I was on my way to 240 pounds. When I backed up, I beeped. Australian mom Taryn Brumfitt wants to make a documentary to help women love their bodies, even if they are not “perfect.” Especially after they have kids, and curves appear where they didn’t exist before. Or even if child-bearing had nothing to do with the lumps that she formerly viewed as unflattering. So she is raising money through kickstarter to make her film. You can read about it here. 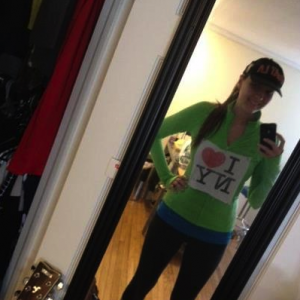 Most impressive is that she originally did not like her body and the way she looked in the mirror, so she started changing her appearance by exercising, dieting and going to the gym. Then she became a bodybuilder who competed in contests. Surprisingly, she says in her video, this did NOT change the way she felt about her body!!! Nothing changed. Once she had a child, she really became upset, posted the picture to the right, and it went viral. So she interviewed women, gives speeches, and now wants to make the documentary. You can read more about her here . I went to a dance recital the other day in which 165 girls, age 10-13, including my granddaughter, performed in groups of 5-20 for maybe five minutes. There were 28 different dances, each group performing twice. Each dance had its own distinctive professional-looking costume. It was pleasant, mostly mediocre. Lots of parents and friends clapping and shouting for their kids and grandkids. An audience of 750, all of us very supportive. I usually look for one or two girls in a group who have real energy and talent and focus on them. But I couldn’t find more than a couple in the whole two hours. However there was one girl who was sensational. She stood out so magnificently that I couldn’t take my eyes off of her in both of her performances. What made her so exceptional is that she is afflicted with Marfan Syndrome. She does not have a normal body shape, she couldn’t move as effortlessly and gracefully as others around her, and when the girls in her group would kneel or lie on the ground, she would be the only one standing and twirling as best she could. People around me were passing out tissues and crying uninhibitedly. I learned that this girl has had around 50 operations to allow her to even stand up, and it was one of the bravest, most courageous accomplishments I have ever witnessed. I picture so many of the “normal” girls fretting that a hair was out of place or that their lipstick was a tiny bit smudged. And then I picture this special girl knowing that people will stare at her, maybe laugh at her, risking embarrassment and humiliation. Not every kid who is a teenager or younger appreciates what an astonishing achievement it is for this girl to chance being jeered at. I remember giving speeches in front of 200 people, performing in front of 500 as part of a group that had completed a juggling course. I was nervous. I’ve known experienced actors who admit they are scared, maybe even nauseous, before every performance. Yet here was a girl of just 12 or 13 who was wearing her ballerina tutu and moving as best she could, while knowing that it was awkward and noticeably “inferior” compared to all the other girls in the recital. But it wasn’t inferior…it was far far better, because we used different standards in making our assessments. All of us in the audience accepted that these girls were building self esteem, having fun, learning to be part of a team, enjoying moving to music, discovering the rewards of weekly discipline and dozens of rehearsals. All part of growing up to live in adult society. This special girl, this apparently disabled girl, was no exception. She and her parents were no different than the others in choosing to be involved in this program. It was a blessing, an inspiration and a joy to watch her accomplishment in motion. It was one of the most poignant performances of my life. I feel privileged to have been there and will never forget her. BTW I learned that Michael Phelps has Marfan Syndrome. Who’d have guessed? He has certainly used his unusual body shape, longer fingers and arms to set Olympic records in swimming competitions. Maybe the girl I saw dancing will be as fortunate to discover some milieu in which her distinctive qualities can transport her to unimaginable successes. A lesson for all of us normals. Here is a sad and unexpected result from exercise and weight loss: the jealousy of others you hang out with, and the lustful looks from guys who think your hot. Change can be very confronting for others. Ten years ago, I was almost 60 pounds more than I am now. I had cut my hair short, added a few highlights and really had this frumpy vibe going on. I had two kids at the time, ages 6 and 2. I was trying to be taken seriously as a good mommy and had let myself go. I was eating a ridiculous amount of sugar. I cared way too much about what other women thought of me. I formed new friendships with the moms from school and they frequently revolved around food. I hated the way I looked, but I fit in. After seeing the pictures from a trip to Disney with my family, I wondered how I let it happen. I knew I was wearing a size 14 and at five feet tall, it looked like I was wearing an even bigger size. I had a double chin and knew if I didn’t stop this weight train, I’d be even bigger. I lost 50 pounds in six months. I changed how I ate and worked out like crazy. It was great and I felt pretty… except for a few ugly things. First of all, one of the moms joked that if I lost any more weight, no one would want to hang out with me. I already felt that. There was a judgment thing going on and of course jealousy could have been behind it. Also, people don’t like when we change. It bugs them out. It makes them confront certain parts of themselves they think they can’t change. Many times when a woman would see I lost weight, she would tell me how they should lose weight or give me excuses why they haven’t. I never knew what to say. I’d offer tips, but the conversation never really seemed to be about weight in the end. Don’t waste mental energy asking yourself if you CAN do something. Just do it. You’ll surprise yourself. I did. Be clear about your objectives. Ignore others, stay true to yourself and measure success only against your own criteria. I was last to finish the race – big deal. I went out there to learn about myself, and I did. The only constant in life is change. So don’t get depressed by the bad times, and don’t get over-excited by good ones. Accept that things are exactly as they are, and even bad times have something to teach us. You used to be a management consultant. Why the change? “I’ve been fortunate enough to find out through personal experience that money and material possessions don’t make you happy. I used to think that they would, but instead found that the materialistic lifestyle left me feeling empty and unfulfilled. I did an interesting exercise one day – I sat down and wrote two versions of my obituary. The first was the one I was heading for if I carried on in my present lifestyle, and the other was the one I dreamed of having. They were very different. To an extent – anything to do with the ocean is dangerous. But equally I could get on the London Underground and get blown up, or go to cross the street and get hit by a bus. You can’t wrap yourself in cotton wool if you want to really live life. And I do all I can to reduce the risks. 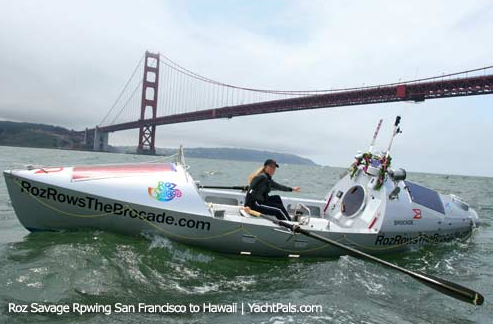 And I seem to go into a different mindset when I am on the ocean. I am extra-vigilant, and more sensible and practical than on dry land. I’m very aware that when you’re on your own in the middle of an ocean, there are no second chances. You can read more about her here and here. On the youtube page that showed this different, earlier video below, Roz disclosed that she rows completely naked, except for her baseball cap. No fear of sunburn and skin damage either. What a woman! I DO understand the environmental issues Roz is promoting (I’ve worked in environmental policy)… so I’m a tad embarrassed to be asking this trivial question: Roz, While rowing, you are always wearing singlet-tops. Aren’t you worried about getting skin cancer? Sunscreen can only protect you to a certain extent – especially when you’re sweating. Thanks for your concern! I use organic sun cream to protect my skin. Actually I don’t usually wear even a singlet top – I’m usually wearing nothing but a baseball cap, but I put clothes on for filming! You are entering my life just at the right time…I have 8 summers left, doing a lot of self awareness work and at 64 still trying to figure out what I want to be when I grow up. Sick and tired of being sick and tired. So why don’t you break free? It might not be as hard as you think–and once you get to the other side, life can be amazing!! Here is a very inspirational story about a Korean shipyard worker whose work screwed up his lungs, so that he needed surgery to breathe better. How he responded is an amazing achievement! Sim Jae-Duk, 44, started running after six years of nine-hour workdays inside the ships, breathing chemicals and dust through a face mask. His respiratory system was so weak that in 1993, doctors recommended surgery to help him breathe. But Mr. Sim, a determined man if there ever was one, refused an operation. “Instead of surgery, I decided to run,” he said. “I decided that, even if I died, I would die running, with my lungs full of air.” His lung capacity, measured in 2003 at 69.5 percent, now registers as normal, he said. Despite still working five or six days a week at the shipyard—he now repairs welding machines—he runs three marathons a month; in spring and fall, as many as seven. In all, Mr. Sim has run 210 amateur marathons since 1995, and finished all but three of them under three hours. His personal best is 2:29:11, compared to the men’s professional record of 2:03:23. Mr. Sim’s 90 victories are widely considered South Korea’s amateur best, although there is no official agency compiling amateur data. He sometimes runs a marathon on Saturday and again on Sunday, and has won six such back-to-back marathons. He excels in so-called ultrarunning endurance races, typically double the length or several times longer than the 26.2-mile marathon and often conducted on mountain trails. He has run more than 30 such races at home and abroad and won 10 of them. “I am happier running than walking,” he said in an interview at his home. 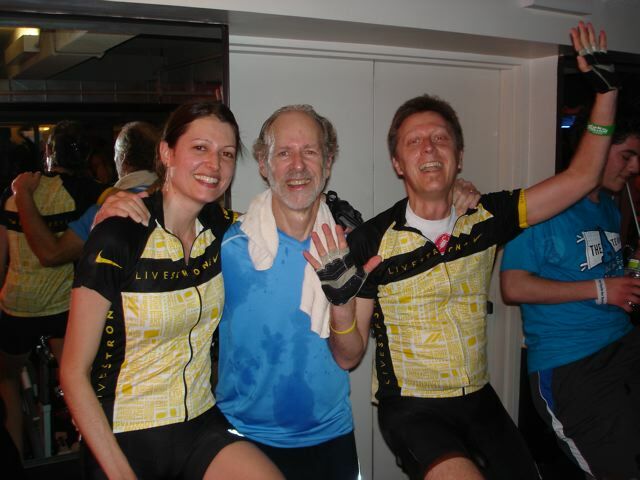 And here he is in 2006 after setting a course record in the 100-mile MMT mountain run in Virginia. 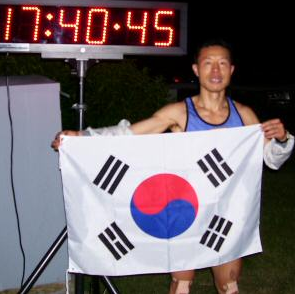 Sim Jae Duk, 36, only arrived in the United States on the Thursday before the run after traveling for 22 hours from his home in Korea. He was an unknown. But very early in the race, he asserted himself. He powered through the Shawl Gap aid station (8.7 miles) tied for second place and took over first place by Habron Gap (24.4 miles). From then on, Sim battled with Karl Meltzer for the lead, finally winning in 17:40:45, a new course record. Karl became only the second person to run under 18 hours when he finished in a time that would have won all previous MMT’s. Here is another inspiring story: a girl is born with spina bifida and has no use of her legs…paralyzed from the waist down. 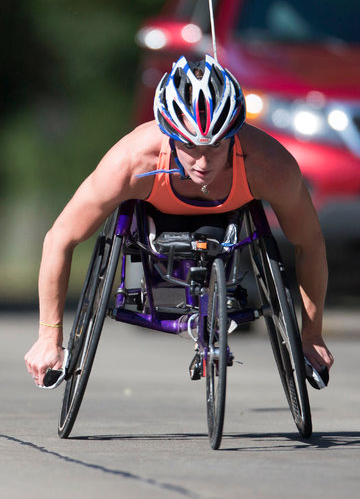 So she walks on her hands, develops extraordinary arm, shoulder and back muscles and grows up racing in wheelchair marathons. She wins them, excels at skiing. Amazing. What makes the difference between a person like this and one who just vegetates in a wheelchair and does nothing? Parenting? A mentor? You have to admire this kind of achievement. And Tatyana is going for first place in three major marathons in a year, which no one able-bodied or disabled has apparently ever done…she has won this year the Boston, London and is now training for the Chicago Marathon. Good luck!!! I love this elder athlete’s advice: “It isn’t just about staying healthy, but it’s about having goals,” he said. Also of interest is that he took off his oxygen mask at the top to pose for pictures, and it almost cost him his life. 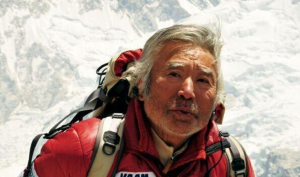 TOKYO (AP) — The 80-year-old Japanese mountaineer who last week became the oldest person to reach the top of Mount Everest says he almost died during his descent and does not plan another climb of the world’s highest peak, though he hopes to do plenty of skiing. 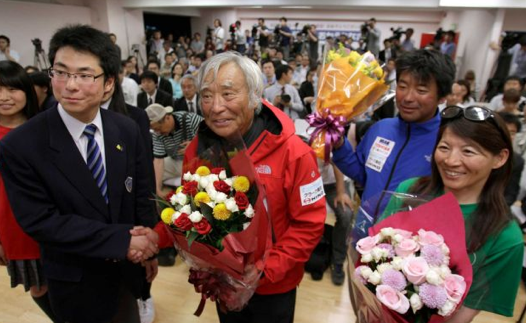 Yuichiro Miura, who also conquered the 29,035-foot (8,850-meter) peak when he was 70 and 75, returned to Japan on Wednesday looking triumphant but ready for a rest. He was sympathetic toward an 81-year-old Nepalese climber who on Tuesday abandoned his attempt to climb Everest, and break Miura’s record, due to worsening weather. Min Bahadur Sherchan, the Nepalese mountaineer, faced difficult odds due to the brief climbing window remaining after delays in getting funding for his own ascent, Miura said. “He is to be pitied,” said Miura, who had downplayed any talk of a rivalry. 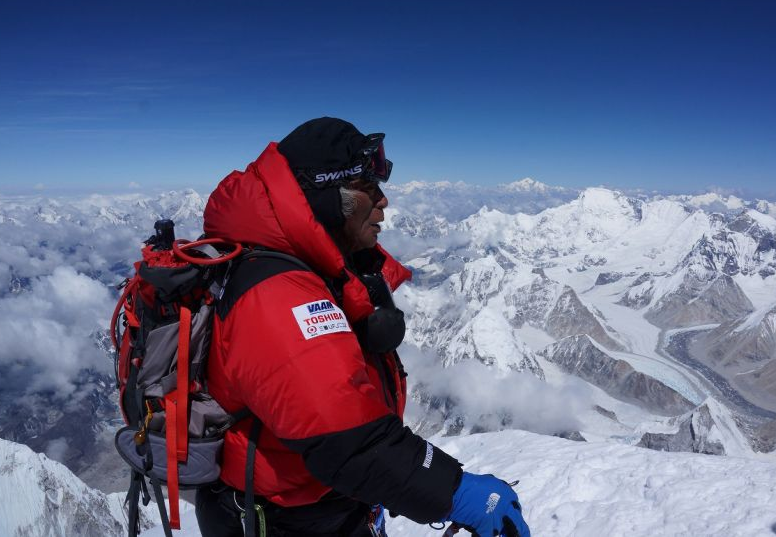 Sherchan became the oldest Everest climber in 2008 at age 76 and held the record until Miura’s ascent last week. The Nepalese climber said he slipped and fell just above the base camp three days earlier, hurting his ribs, so he was airlifted back to Katmandu, where he saw a doctor. He plans to try again to regain his record, perhaps next year. “I still have a few more years to make my attempts. I will try until I reach 84 and then quit,” Sherchan said. Miura and his son Gota, who has climbed Everest twice, said things went well during their expedition because they carefully paced themselves, walking only half-days and resting in the afternoons. “We took our time. You get tired when you are old,” he said. But Miura said he was dangerously weak at the beginning of his May 23 descent. Though he felt fine after he removed his oxygen mask on the summit to pose for photos and enjoy the view, he suffered for it on the way down. Helped down by Gota and others, Miura revived after having some food and water at the team’s 8,500-meter (27,887-foot) -high base camp. A friend sent me this very inspirational story about Scott Belkner, who was born with Cerebral Palsey and has dealt with this in a very impressive and memorable way. He was also featured on Reddit, and you can read people’s comments and questions–and Scott’s answers–right here . Some of Scott’s words worth repeating are: Go big or go home… If you can’t do it in one try, keep trying…To people who don’t have a disability, you need to stop feeling sorry for us: that don’t help us. After Four Heart Surgeries And A Broken Pelvis, This 80-Year-Old Climbs Mt. Everest…Again! The news story headline might be enough to talk about: Eighty Year Old Man Scales Everest. But there are other facts even more impressive. More than 200 people have died trying to scale Everest, since the first successful attempt in 1953. A few weeks into the climbing season at Everest this year, several records have already been set. Last weekend, Raha Moharrak became the first Saudi Arabian woman to reach the summit, while 30-year-old Sudarshan Gautam, a Canadian born in Nepal, became the first double amputee to conquer the summit. Saw this article about a 56-year-old woman, Sharon Simmons, who has worked out for over 35 years and started competing in fitness competitions just seven years ago, at 49. Of the 20 she entered, she came in first in nine and placed in two national competitions. She also wrote a couple of books about fitness, not letting age and others’ opinions hold you back, and at 55 tried out for a Dallas Cowboys cheerleader slot. You have to admire her spirit and fearlessness to take emotional risks. No doubt she is exceptional with her physical abilities and looks at her age. Few grandmothers look like her. And even fewer women in their mid-fifties. But her attitude and life style are part of the reason. Check out her web site . And here are excerpts of the article, which includes eight of her lessons for aging and living well. Though Simmons has a long list of fitness competition wins, having a place in the winners’ circle isn’t what motivates her. “It’s about getting there,” she realized after her first fitness competition in Las Vegas in 2006. Over the course of her fitness modeling career, Simmons has had her fair share of criticism from friends, family and strangers alike, she said. In early 2010, I was serving as a Platoon leader in the 82nd Airborne. On a dismounted patrol my platoon was ambushed by the Taliban and I lost my leg in combat. I flatlined 3 times, I endured 47 surgeries, would need 52 blood transfusions. I fought through them, and I continue to fight every day of my life. I will fight until the day I die. I am an American Airborne Ranger…that is what I do. People always ask, “What motivates you?” This question comes up at least 3 times a week while in the gym. I can only assume someone sees me, my leg and other injuries and imagines how difficult it must have been to recover from such a traumatic event. My response is always the same, “What the hell else am I supposed to do?” Three years ago I was an Infantry Officer with the 82nd Airborne, had a Ranger Tab, and I was jumping out of airplanes and leading men in combat. Now, because according to your standards I’m “disabled,” am I supposed to be a different person? Sit around and feel sorry for myself? That’s not in my nature; it’s not a choice I’m willing to accept. A friend sent me this link to a New York Times story that shows the beauty of movement by just “average, ordinary people.” I am awed again by the secret lives,experiences and talents of those you pass by in the street so casually, even indifferently. You might think most strangers are uninteresting—and some could be. But a number of them have fascinating pasts and capabilities that you could never imagine. So as you watch this video, think about your next crowd and what potential is lurking there, totally hidden from your sight and mind. On another note, though a published story, only 650 views of the video had been clocked when I looked. As video concepts go, it was pretty simple: hit the streets and parks of New York with a boombox playing a dance remix of your band’s song and ask passers-by of all ages, races, shapes and sizes to move to it. Film the results. Here, then, is the newly released video for “It’s Illicit” by the rock-ish band Motive, as remixed by an Italian group called Late Guest at the Party. It was shot late last summer at nine varyingly iconic New York City locations, including St. Marks Place, Flushing Meadows Park, Bedford Avenue in Williamsburg, and Coney Island in front of a wall that was later damaged by Hurricane Sandy. Ari Goldstein, the band’s manager and the conceptualizer of the video (it was directed by Mark Carrenceja), promised that apart from the band members, everyone who appears in it was an actual random person passing by. My tennis mentor, ping pong enthusiast, stand-up comic, songwriter and stage performer Joe Marshall sadly moved away from me. I miss him and his great counseling on the court, so now we are limited to email. However Joe recently sent me a little story and video about his son, who is extraordinarily talented. This is a justifiable Proud Papa tale. And it makes me feel that jugglers aren’t really appreciated for all the years they train to do something you can see in just a minute or two. Be sure to keep watching past 49 seconds, when the super hard stuff begins. This is a video of my son, Nate Marshall. He is a very popular touring singer/songwriter, along with his wife….they are billed as Nate and Kate. Nate is a self-taught musician, plays guitar, harmonica, piano, and banjo, all at a very high level…..to give you an idea…if you’ve ever heard John Popper’s song “Runaround” with the fabulous harmonica, Nate plays that exactly WHILE he is also playing the guitar part….but his song-writing is terrific, he is known for his sensitive poetry and social comment but he can rock too. Something else I meant to say about Nate is that he could juggle three until he was 20, but at 20, he saw some guys in Chicago juggling seven, so he said, “I wanna do that’ It took him five years, but at the same time he was studying music theory, teaching lessons (he is a fine teacher of all his skills and is in demand), and writing, learning new instruments, arranging four albums, and touring…and all the business work that goes with it. How Derek Rabelo Surfed The World’s Most Dangerous Wave…Blind! No doubt this kid is an inspiration. Though blind, he surfed the most difficult and dangerous wave in the world! What I like best is that he uses “other means” to achieve his surfing goals. He says, “Each style of wave makes a different noise…a tubular one type, a fat wave another…when a wave is open, it makes a different noise…from when it is closed.” Maybe I could learn some “other means” to return a tennis ball. I better, because the most important requirement is to “watch the ball,” and I forget to do that at least 50% of the time! Derek Rabelo lost his eyesight to glaucoma when he was just one year old, but that setback has not stopped the 19-year-old from becoming proficient in a wide range of outdoor sports, including swimming and skating. In his own words: “I don’t feel different from others. I feel normal, and I don’t feel limited at all.” He especially loves to surf, following in the footsteps of his father and uncles. In February, filmmakers from “Story Hunter” followed Rabelo with a few cameras to document his trip to Hawaii, where his dream became reality — he successfully surfed the Banzai Pipeline. This particular area is known for being perilous to surfers with its huge waves and shallow water. Rabelo navigated the waves with ease, providing inspiration to even professional surfers who would later see his videos. Indo Surf Life tweeted, “Next time we complain about life being unfair, we should remember this kid.” Not sure we could ever forget Rabelo or his courage. You are currently browsing the archives for the OTHER PEOPLE’S STORIES category.